Opening tonight Tuesday 26 at MetaHouse at 6 pm, a poster exhibition Creativity In The Cities that depicts creative spaces in east and south east Asia and Europe. “The core objective is to increase awareness that culture and creativity can be considered as key assets of urban development and that creative spaces may serve as a visual spatial symbol to connect art with city space and citizens. […] Nowadays, the value of creative spaces lies not only in economic possibilities, but in their intrinsic value as vehicles for the preservation of (industrial) cultural heritage and promotion of the arts.” From 8 pm a panel of local arts figures will discuss the developments and inspirations for the arts in Phnom Penh. Also tonight Tuesday 26, the annual student concert awards ceremony for Dance World Cambodia is being held at 6.45 pm at ICAN British School on Sothearos Blvd. Tickets on sale at Java Café and, if any are left over, on the door. On Wednesday 27 at 7 pm, Meta House hosts Art School Night, in which art students and teachers a wide range of artistic pursuits will deliver short talks, performances, presentations and Q&A. From 6.30 pm on Thursday 28 at the French Institute, images of World War One from French cartoonist Jacques Tardi’s book Putain de guerre, examining “connections between time and storytelling, between memory and oblivion, truth and subjectivity.” Also included will be works produced in 2014 by students of the Lycée français René Descartes who designed two boards, as part of the project Cambodians and World War One. Also on Thursday 28, at Meta House at 8 pm, the launch of Transitioning Cambodia, a book of photographs “to showcase the social, environmental and political progress and setbacks of modern-day Cambodia.” Images by Nicolas Axelrod with words by journalist Denise Hruby. On Saturday 30, the fourth anniversary of Sammaki Gallery in Battambang (#87 St 2.5) will be celebrated with the opening of a new exhibition, Meet the neighbours, featuring photographs from Ben Valentine and drawings, paintings and sculptures by local children. There will also be live performances from Yom Young and Keo Sasstra. Fun starts at 5 pm. Coming up on Wednesdays in June, Phnom Penh Community College presents workshops entitled Fundamentals of Drawing under direction of France Damon. Tuesday 26, 6 pm at MetaHouse, a poster exhibition Creativity In The Cities that depicts creative spaces in east and south east Asia and Europe. From 8 pm a panel of local arts figures will discuss the developments and inspirations for the arts in Phnom Penh. Tuesday 26, 6.45 pm at ICAN British School on Sothearos Blvd, the annual student concert awards ceremony for Dance World Cambodia. Wednesday 27, 7 pm, Meta House hosts Art School Night, in which art students and teachers a wide range of artistic pursuits will deliver short talks, performances, presentations and Q&A. Thursday 28, 6.30 pm at the French Institute, images of World War One from French cartoonist Jacques Tardi’s book Putain de guerre, including works produced in 2014 by students of the Lycée français René Descartes. Thursday 28, 8 pm at Meta House, the launch of Transitioning Cambodia, a book of photographs “to showcase the social, environmental and political progress and setbacks of modern-day Cambodia.” Images by Nicolas Axelrod with words by journalist Denise Hruby. Saturday 30, 5 pm at Sammaki Gallery in Battambang, fourth birthday celebrations and the opening of a new exhibition, Meet the neighbours, featuring photographs from Ben Valentine and drawings, paintings and sculptures by local children. 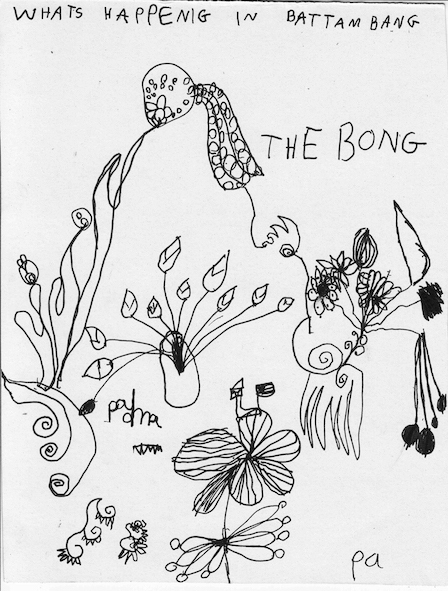 SaSaBassac presents their new exhibition Having a hole or empty space inside, a collection of drawings and sculptures by Yim Maline. At The Plantation: Water is Life by renowned Khmer photojournalist Remissa Mak. On Wednesday 20, the monthly Open Stage Poetry night at Java Café features Emily Weitzman and Tony Morewood. As usual, the writers’ meet up commences at 6.30 pm, featured readers at 7.30 pm, then open mic. 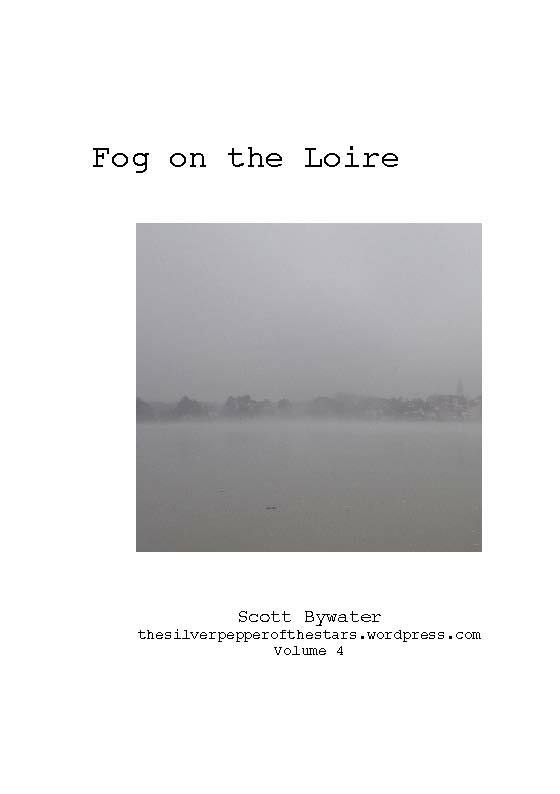 Thursday 21 from 7 pm at Opera Café (St 13 near St 178) poet Scott Bywater launches Fog on the Loire, the fourth volume of poetry in thethesilverpepperofthestars.wordpress.com series, featuring poems written in Cambodia and France over the last 18 months. Reading and sales, but sorry no WASHperformance this time. For four shows, Thursday 21 to Sunday 24, Sophiline Arts Ensemble presents the acclaimed ballet Pamina Devi, by Sophiline Cheam Shapiro, at the Department of Performing Arts Theatre (see number 14 on this map). Originally commissioned for a Mozart festival in Vienna in 2006, this work has been performed in the US and Europe, but was only staged in Cambodia once, back in 2011. Thursday to Saturday at 7 pm, Sunday matinee at 4 pm. The Develop Boeung Kak Art project at the Lakeside neighbourhood is holding a weekend open house Art and Solidarity festival on Friday 22 and Saturday 23. Plenty of music and street art is promised. On Saturday 23 Simphony School of Music & Art presents its fifth annual concert and painting exhibition at the InterContinental Hotel. Shows at 10 am and 3 pm – open to the public but advance registration is required (call 023 727 345). On Saturday 23 from 7 pm, Java Café hosts a youth open mic night – Slam, Jam, Thank you Ma’am – a chance for younger performers of music, poetry or theatre to test themselves in front of an audience. Encourage the talented young person in your circle to come along and share their skills – some instruments will be provided but performers can bring their own. Through the week Meta House’s LGBTI film festival, I am what I am, presents short films and features from around the world on LGBTI themes. Wednesday 20, the monthly Open Stage Poetry night at Java Café features Emily Weitzman and Tony Morewood. Writers’ meet up at 6.30 pm, featured readers at 7.30 pm, then open mic. Thursday 21, 7 pm at Opera Café (St 13 near St 178) poet Scott Bywater launchesFog on the Loire, featuring poems written in Cambodia and France over the last 18 months. Thursday 21 to Saturday 23 at 7 pm; Sunday 24 at 4 pm, Sophiline Arts Ensemblepresents the acclaimed ballet Pamina Devi, by Sophiline Cheam Shapiro, at theDepartment of Performing Arts Theatre. Friday 22 and Saturday 23, Develop Boeung Kak Art project at the Lakeside neighbourhood is holding a weekend open house Art and Solidarity festival. Saturday 23 at 10 am and 3 pm, Simphony School of Music & Art presents its fifth annual concert and painting exhibition at the InterContinental Hotel. Advance registration is required (call 023 727 345). Saturday 23 from 7 pm, Java Café hosts a youth open mic night – Slam, Jam, Thank you Ma’am – music, poetry, theatre or anything. Asia Foundation Community Art Gallery (#59, Street 242) presents Phnom Penh: Open City, Open Mind, featuring the work of Chhunly Poy and Kolab Koeurm (animation), Davit Pum (architecture), Chansi Voung (art and architecture), Prom Putvisal (painting and etching) and Kim Philley (fiction). Until June 11. Meta House hosts Anarchy is Dead!, an exhibition of paintings by Gregory Osborn, introducing the new mystery school Entelarchy. It’s a quiet week ahead in the Cambodian arts. Commencing on Sunday 17, Meta House presents their annual LGBTI film festival, this year titled I am what I am, as part of the Cambodian Pride celebration. The seven day film programme showcases documentaries, shorts and feature films from Cambodia and abroad. Coming up next week at Java Café: the monthly Open Stage poetry event on Wednesday and a special youth open mic night – Slam, Jam, Thank you Ma’am – a chance for younger performers of music, poetry or theatre to test themselves in front of an audience. And just released, ahead of an official launch party at Opera Café next Thursday, is Fog on the Loire, the fourth volume of poetry from good friend of Kumnooh Scott Bywater, featuring poems written in Cambodia and France over the last 18 months. At the FCC Phnom Penh: No One Should Work This Way, a documentary project by Bangkok-based journalist Karen Emmons and photographerSteve McCurry to record and expose abuses faced by migrant domestic workers in four Asian countries. At Sammaki in Battambang. Battambang: Recent Works features works by Srey Bandol, Nov Cheanick, Khchao Touch, Chov Theanly,Hour Seyha, Sou Sophy, and Ben Valentine. At ARTillery Café is Creative Charcoal, a collection of works addressing the issue of women’s empowerment in Cambodia, entries in a RUFA competition for International Women’s Day. Tonight, Tuesday 5 at Java Café, Amrita Performing Arts presents a conversation with upcoming choreographers Khon Chan Sithyka (Mo), Chumvan Sodhachivy (Belle) andYon Davy, following a presentation of works in progress last Saturday night. A chance to get a greater understanding of the motivations and inspirations for young artists. Starts at 6 pm. The Phnom Penh Players present a string of theatre performances this week at Meta House, from Wednesday 6 through to Saturday 9 (including a Saturday matinee). For Their Soul is a short work written by 16 year old Manchoo Kim and directed by 15 year old Hannah Shaw, seeking to raise awareness of LGBTi issues. Entry $5. Nightly at 8 pm, plus 1 pm Saturday. The Tini Tinou Circus Festival 2015 runs from Thursday 7 to Saturday 9 in Phnom Penh, Monday 11 to Wednesday 13 in Siem Reap, and then Friday 15 and Saturday 16 in Battambang. A range of cutting edge circus performances from Cambodia, Switzerland, Taiwan and Vietnam. On Thursday 7 at 6 pm, a new exhibition opens at the FCC: No One Should Work This Way, a documentary project by Bangkok-based journalist Karen Emmons and photographer Steve McCurry to record and expose abuses faced by migrant domestic workers in four Asian countries. At Meta House on Thursday 7, the Cambodian premiere of the documentary If one thing matters – a film about Wolfgang Tillmans. Director Heiko Kalmbach, who spent four years with the photographer Tillmans, will hold a Q&A following the 7 pm screening. On Sunday 10, Meta House presents selections from Interfilm Berlin 2014’s Japanese short film focus. “Fantastic surreal animations, stories of moral codices of families, bizarre games of young people, the contrast between tradition and modernity give an exciting view on modern Japanese society.” From 7 pm. Just published and now available online is Patrick Samnang Mey’s new graphic novel Captain Cambodia, a fusion of politics, religion and magic rooted in the current issues of today. Congratulations to Cambodian artist Anida Yoeu Ali, who has won the prestigious Sovereign Asian Art Prize for Spiral Alley, an installation at Java Café in 2012 as part of the artist’s Buddhist Bug collection. The award, that recognises contemporary Asian artists, has been running for 11 years; this is the first win by a Cambodian. Last weekend a new exhibition opened at Sammaki in Battambang. Battambang: Recent Works features works by Srey Bandol, Nov Cheanick, Khchao Touch, Chov Theanly,Hour Seyha, Sou Sophy, and Ben Valentine. Currently running at ARTillery Café is Creative Charcoal, a collection of works addressing the issue of women’s empowerment in Cambodia, entries in a RUFA competition for International Women’s Day. Tuesday 5, 6 pm at Java Café, Amrita Performing Arts presents a conversation with upcoming choreographers Khon Chan Sithyka (Mo), Chumvan Sodhachivy (Belle) andYon Davy, following a presentation of works in progress last Saturday night. Wednesday 6 to Saturday 9 at 8 pm (plus a Saturday matinee at 1 pm) at Meta House: For Their Soul, a theatrical short work written by 16 year old Manchoo Kim and directed by 15 year old Hannah Shaw, seeking to raise awareness of LGBTi issues. Entry $5. Thursday 7, 7 pm at Meta House the Cambodian premiere of the documentary If one thing matters – a film about Wolfgang Tillmans. Q&A to follow. Thursday 7 to Saturday 9 in Phnom Penh, The Tini Tinou Circus Festival 2015. Thursday 7 at 6 pm, at the FCC Phnom Penh: No One Should Work This Way, a documentary project by Bangkok-based journalist Karen Emmons and photographerSteve McCurry to record and expose abuses faced by migrant domestic workers in four Asian countries. Sunday 10 at 7 pm, Meta House presents selections from Interfilm Berlin 2014’sJapanese short film focus. Sunday 10, 8 pm at Meta House, the Piano Shop Concert Series 2015 continues withFiori Musicali, featuring works by Frescobaldi, Scarlatti, Soler and Bach, performed by Italian pianist Alberto Firrincieli.